At the beginning of the 20th century, eating was still considered a rather formal procedure, calling for adequate china, napkins, and cutlery carefully lined on tables. Ice cream was a delicacy of the time, served with great attention and savored with a teaspoon. 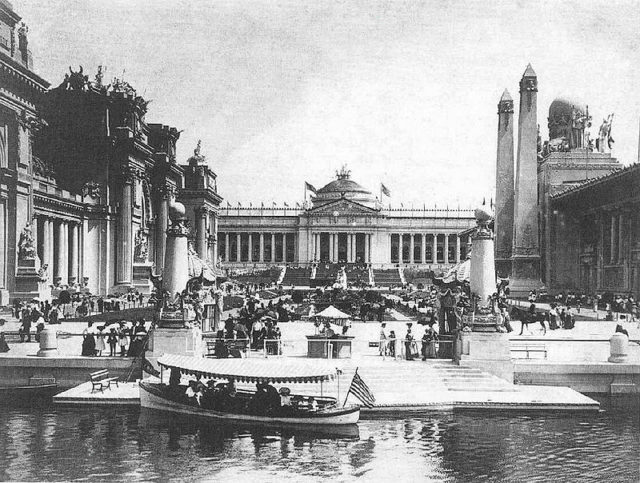 That gourmet ritual, however, changed in 1904, at the World’s Fair in St. Louis, Missouri. The city wanted to recognize the Louisiana Purchase’s significance by organizing a fair. The entire country, and the world, were invited to take part in what was to be the “greatest of expositions.” Also to be honored were explorers Lewis and Clark and their grand journey west. It can be said that the fair was a true embodiment of a culture of abundance. 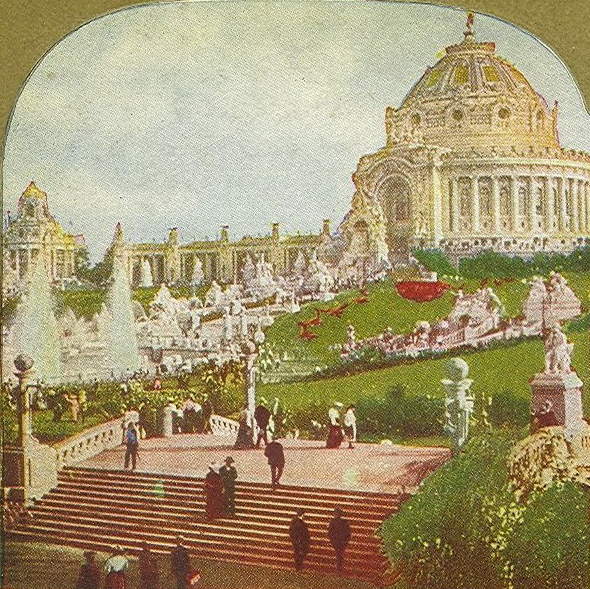 Visitors were surrounded by miraculous gustatory excesses, such as palaces built of sweet corn, sculptures made of butter, towers of breakfast cereal, and animals made of fruit. At the time, America was living in its golden age of agriculture, enjoying the benefits of the gas-powered tractors and other inventive machinery that made food much more easily accessible. The crowds at the fair were dazzled by the tasty wonders around them and impatiently trying one thing after another. One of the concession vendors, the Syrian Ernest Hamwi, made it possible for the visitors to get a quick sampling of the goods by curling a waffle cookie and transforming it into an ice-cream receptacle, that is, the well-loved ice cream cone we all know today. It was a real breakthrough among the ice-cream aficionados–no spoons, no plates or tiny bowls but a fragrant, crispy coned waffle that held in place their favorite flavored, iced indulgence. He called the cone “Zalabia” (a wafer-thin, waffle-like confection sprinkled with sugar). After the Fair, Hamwi sold the invention to J.P. Heckle and helped him to open the Cornucopia Waffle Company. Records have shown that he served up approximately 5,000 free ice-cream cones around the country in order to promote the then-new product. He opened the Missouri Cone Company in 1910. Nevertheless, the story of Hamwi as the cone inventor is a bit shaky since historical records have put forward other names and stories regarding the cone’s invention. Historian Anne Funderburg has come up with seven possible theories of its invention at the 1904 fair. According to Funderburg, there was a Turkish entrepreneur named David Avayou who took credit for the edible cones. He was the owner of a few ice-cream shops in New Jersey and presumably got the idea for an edible cone from France, where ice cream was served in paper or metal cones. Reportedly, after the Fair, he headed toward Philadelphia and set up his own business. Other supposed inventors were Charles and Frank Robert Menches, the two brothers from St. Louis who ran ice cream concessions across the Midwest. The brothers claimed that the cone dawned on them at the 1904 World’s Fair when a lady took one layer of baked waffle and rolled it in the shape of a cone around the ice cream in order to make her eating more efficient. They came up with an idea to take a waffle while warm and wrap it around a fid (a tool for tent ropes) so that when cooled, it would turn into an edible handle for eating ice cream. After the fair, the brothers launched their own business called the Premium Ice Cream Cone and Candy Company in Akron, Ohio, the company which claims credit for today’s Cracker Jacks. 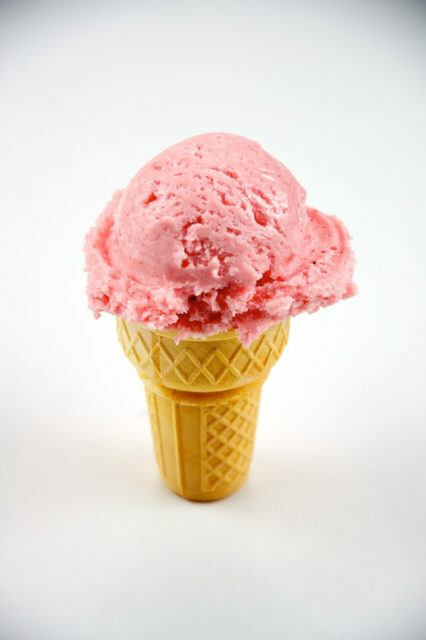 So it’s almost impossible to identify the first cone maker since, according to Funderburg, the Germans invented the ever popular waffle cone in the 19th century. However, America first met the cone at the World’s Fair. 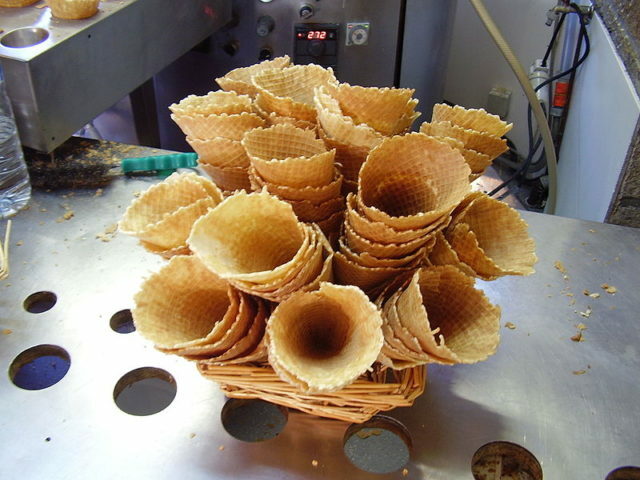 At the close of the Fair, the popularity of the cone outstripped the hand-made rolled waffles, as the huge demand triggered industries to produce machines and molds that would bake immense quantities of ice cream cones.